CoolSculpting treatments can shrink areas of unwanted fat from your chin to your toes without surgery, needles, downtime, or a need for compression garments afterward. As you'd expect with any medical treatment, the best CoolSculpting results are seen when it's performed by trained specialists. At Skinspirations, we know why our CoolSculpting body contouring results turn out better than those seen in other practices. It's because of the passion, advanced training, and team approach our three CoolSculpting experts use to make the entire experience the best that it can be. Our CoolSculptresses work together to develop a customized 360-degree Treatment to Transformation strategy during your consultation, by assessing your body with 2 sets of eyes, determining the exact areas where treatments will produce the most flattering results from every angle. and providing you with an accurate price estimate that will best meet your goals. Recognizing the completion of specialized CoolSculpting training. 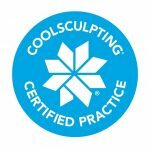 I (Dr. Elliott) also participated in the advanced training and was so proud to be told by the instructors there that my estheticians were some of the best CoolSculpting students they'd ever taught. I was so proud & not at all surprised. 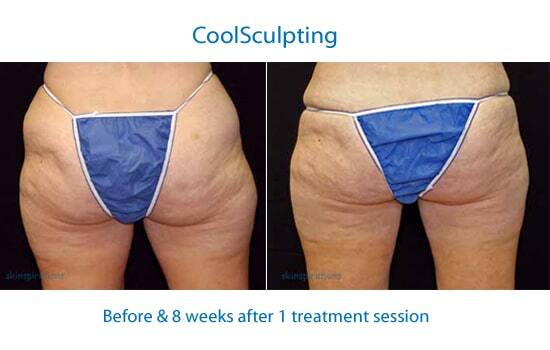 Skinspirations is the only practice in Tampa Bay currently offering a CoolSculpting Patient Loyalty Program. 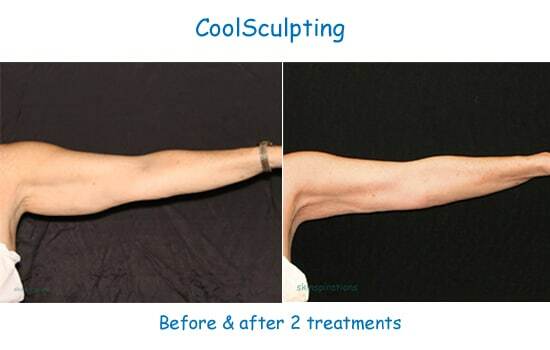 Call 727.571.1923 for more information as to how you can benefit from having CoolSculpting at Skinspirations. Our CoolSculptresses produced the following video to demonstrate the unique CoolSculpting experience at Skinspirations, from the consultation through the treatment. As you can see in the video above, they're all perfectionists with a passion for providing our patients with the best results possible! It was impossible to resist also making a video spoofing what patients have told us about their CoolSculpting experiences done elsewhere, which highlights the importance of seeking out a practice like ours. Unlike weight loss which just shrinks fat cells, CoolSculpting reduces the number of fat cells in a treatment area by cooling them to a temperature that kills a percentage of them, while leaving the surrounding skin and tissues unharmed. Applicators for some body areas use suction to pull the fat up for better penetration of the cold. A percentage of the treated fat cells die and break down over the days & weeks following each treatment and the cell contents that are released are processed much like the fat released from foods. Once fat cells die, they don't return. The treatment is non-surgical, non-invasive, and usually not uncomfortable. There is minimal downtime if any, and patients often resume non-strenuous daily activities almost immediately. A single CoolSculpting treatment may be enough to make a significant difference, but depending on the area & the amount of fat, many patients decide to return for a second or even third treatment to the same area to obtain an even more sculpted look. 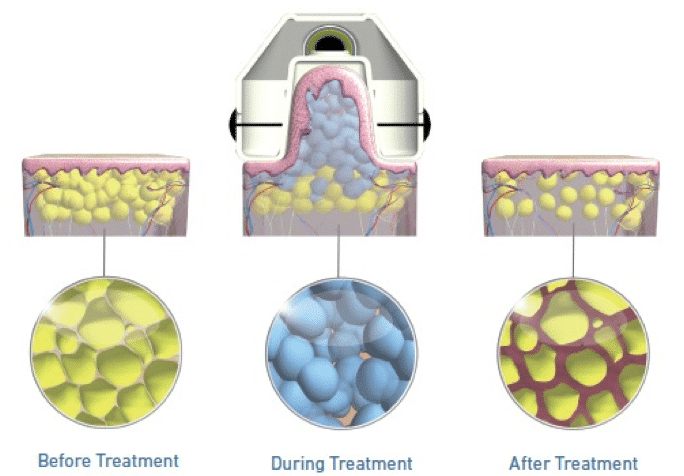 Most patients notice about 20-25% reduction in the fat layer in the treatment area each time a treatment is performed. 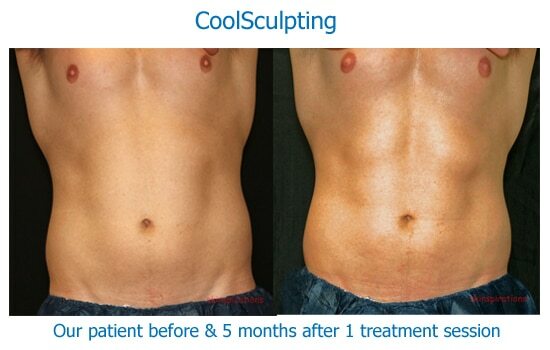 CoolSculpting can be repeated on the same body area until your individual goals are met. Even though many people initially think they want to shrink just one area of unwanted fat, they find that once that area is smaller, reducing other areas makes their 360-degree results even better. Commonly people who have treated the fat on their abdomens realize that shrinking some of the fat on their flanks, or love handles, gives them even a more whittled waist. Similar to the way painting one room in your home suddenly makes you notice that the adjoining rooms also need a new coat, people often notice that after CoolSculpting the areas they were initially concerned with makes them decide to treat other areas as well to get the best 360-degree results. Dual CoolSculpting units can treat both sides of the body simultaneously. attached and depending on what body area is being treated, you may feel a sudden pulling sensation, which is more startling than uncomfortable before the cooling sensation starts. During the treatment, your CoolSculpting team will also make sure you're very comfortable by positioning you so that you can relax & catch up on any Netflix programs you've missed, work on your laptop or device, or have a facial treatment if desired, while those fatty areas quietly freeze away. When the treatment time is up, the applicator is removed and the area is firmly massaged for two minutes, which may feel uncomfortable but is over before you know it. How does it feel after a CoolSculpting treatment? The areas treated with CoolSculpting are often sore and swollen immediately afterward and sometimes bruised. The swelling is usually better after a few days but the soreness may persist for up to a few weeks, depending on the area treated. Many people notice some mild, temporary numbness for a few weeks as well. We like to think of the discomfort & numbness associated with CoolSculpting as the noise overheard from the party of dying fat cells. For larger abdomens, the largest CoolSculpting applicator, called CoolMax, is used to give the most dramatic fat reduction.Some patients who are treated with the CoolMax applicator develop a burning type of pain that starts about 3-4 days after the treatment, and is rarely seen when smaller applicators are used. This pain is probably due to the effect of the cold temperature on the fatty lining of the nerves and is relieved by prescription medications for nerve pain, which we can dispense. How long after my CoolSculpting treatment will I see results? Some patients can begin to see a reduction in the treated areas or notice their clothes fit better, in as little as three weeks, but usually results become visible in about 3 months, and continue to improve for at least six months after each treatment. CoolSculpting causes a percentage of the fat cells in the treated area to die & dissolve, so they won't return. If you gain weight, the remaining fat cells throughout the body will increase in size diffusely, including those in the treated area, although the number of cells in the treated area will remain the same. Maintaining a healthy weight will help you to appreciate your results long-term. How do I know if I’ll get the results I want with CoolSculpting? CoolsSculpting is effective on subcutaneous fat, which is the padding that lies just below the skin but above the muscle. People with large abdomens who don't feel a thick, soft fat layer just under the skin when they tense their abdominal muscles, have more mesenteric, or visceral fat, than subcutaneous fat, and are not good CoolSculpting candidates. Coolsculpting is not a weight loss method & it is designed to give the best results for those people who have localized, resistant fatty areas despite good diet and exercise habits. Because the CoolSculpting treatment uses cooling, those with the rare medical conditions of cryoglobulinemia or paroxysmal cold hemoglobinuria can not undergo CoolSculpting. The CoolSculpting applicator cannot be placed over a known hernia, repaired hernia site or a recent surgical incision. Call Skinspirations at 727.571.1923 for a complimentary Treatment to Transformation assessment by one of our CoolSculpting specialists, with hours available Mondays through Saturdays.